Acetic Acid (CH3COOH) Mildly corrosive liquid used in etching. Acetone (CH3COCH3) Flammable liquid used for cleaning. Aluminum (Al) A solid metal used to form the electrical interconnections between chip components. It is usually applied in a deposition process called metallization. Ammonia (NH3) Explosive, toxic gas used in vapor deposition and etching. Ammonium Hydroxide (NH4OH) Oxidant liquid used for developing. Antimony Trioxide (SbO3) A toxic solid used as a dopant. Arsenic Pentafluoride (AsF5) Toxic, corrosive gas used in ion implanting. 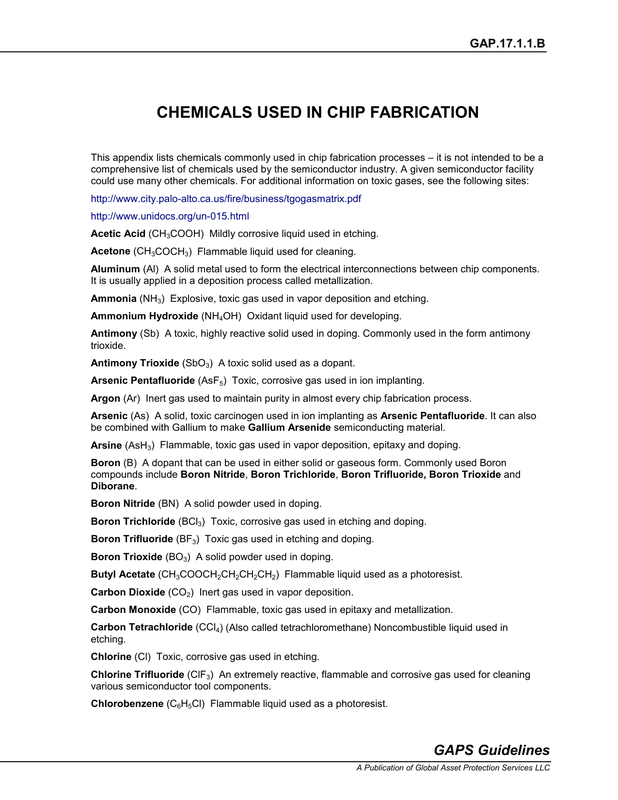 Argon (Ar) Inert gas used to maintain purity in almost every chip fabrication process. be combined with Gallium to make Gallium Arsenide semiconducting material. Arsine (AsH3) Flammable, toxic gas used in vapor deposition, epitaxy and doping. Boron Nitride (BN) A solid powder used in doping. Boron Trichloride (BCl3) Toxic, corrosive gas used in etching and doping. Boron Trifluoride (BF3) Toxic gas used in etching and doping. Boron Trioxide (BO3) A solid powder used in doping. Butyl Acetate (CH3COOCH2CH2CH2CH2) Flammable liquid used as a photoresist. Carbon Dioxide (CO2) Inert gas used in vapor deposition. Carbon Monoxide (CO) Flammable, toxic gas used in epitaxy and metallization. Chlorine (Cl) Toxic, corrosive gas used in etching. Chlorobenzene (C6H5Cl) Flammable liquid used as a photoresist. Chromic Phosphoric Acid (CrPO4) Noncombustible liquid used in stripping. is usually applied in a deposition process called metallization. Diborane (B2H6) Pyrophoric, toxic gas used in vapor deposition and epitaxy. Dichlorosilane (SiH2Cl2) Flammable, corrosive gas used in vapor deposition and epitaxy. Dimethylzinc [(CH3)2Zn] Flammable, toxic gas used in vapor deposition. Disilane (SiH6) Flammable gas used in vapor deposition. Ethanol – See Ethyl Alcohol. Ethyl Alcohol (C2H5OH) (Also called ethanol) Flammable liquid used as a photoresist. Ethylbenzene (C6H5C2H5) Flammable liquid used as a photoresist. Ethyl Lactate (CH3CH2OCOOC2H5) Flammable liquid used as a photoresist. Ethylene Glycol Monomethyl Ether (CH3OCH2CH2OH) Combustible liquid used as a photoresist. Formaldehyde (HCHO) Combustible liquid used in plating. combined with Arsenic to make Gallium Arsenide semiconducting material. Gallium Arsenide (GaAs) A semiconducting material sometimes used instead of Silicon. Germane (GeH4) Flammable, toxic gas used in vapor deposition and epitaxy. Germanium (Ge) A solid semiconducting material. Also combined with hydrogen to make Germane. Helium (He) Inert gas used for purging tools and flushing chemical distribution piping. Hydrochloric Acid (HCl) Corrosive liquid used in etching. Hydrofluoric Acid (HF) Corrosive liquid used in etching. Germanium and other solids to make process gases like Silane and Germane. Hydrogen Chloride (HCl) Toxic, corrosive gas used in oxidation and etching. Hydrogen Peroxide (H2O2) Oxidant liquid used in stripping. Hydrogen Selenide (H2Se) Flammable, toxic gas used in ion implanting. Hydrogen Sulfide (H2S) Toxic gas used in vapor deposition. Indium (In) Solid used in doping. Commonly used in the form Trimethyl Indium. Isopropanol – See Isopropyl Alcohol. Isopropyl Alcohol [(CH3)2CH2O] (Also called isopropanol) Flammable liquid used for cleaning. Magnesium (Mg) Combustible metal used as a target in ion implanting. Methanol – See Methyl Alcohol. Methyl Benzene – See Toluene. Methyl Chloroform – See Trichloroethane. Methyl Ethyl Ketone (CH3COCH2CH3) Flammable liquid used in developing. Methyl Isobutyl Ketone [(CH3)2CHCH2COCH3] Flammable liquid used for cleaning. M-Pyrol – See n-Methyl Pyrrolidone. Nitrogen (N2) Inert gas used in oxidation, epitaxy and doping. Nitrogen Trifluoride (NF3) Toxic gas used in etching. Nitrous Oxide (N2O) Explosive gas used in vapor deposition. Oxygen (O2) Oxidant gas used in oxidation, diffusion, vapor deposition and etching. Phosgene (COCl2) Flammable, toxic gas used in epitaxy, doping and vapor deposition. Phenol (C6H5OH) Combustible liquid used in stripping. Phosphine (PH3) Pyrophoric, toxic gas used in epitaxy, doping and vapor deposition. Phosphoric Acid (H3PO4) Corrosive liquid used in etching. Phosphorous Pentafluoride (PF5) Toxic, corrosive gas used in ion implanting. Potassium Hydroxide (KOH) Oxidant liquid used in developing. Propanol – See Propyl Alcohol. Propyl Alcohol (CH3CH2CH2OH) (Also called propanol) Flammable liquid used for cleaning. Propylene Glycol (CH3CHOHCH2OH) Combustible liquid used as a photoresist. Dichlorosilane, Hexamethyldisilazane, Silicon Tetrachloride and Silicon Tetrafluoride. Silicon Tetrachloride (SiCl4) Pyrophoric gas used in vapor deposition, epitaxy and etching. Silicon Tetrafluoride (SiF4) Toxic, corrosive gas used in ion implanting and etching. Sodium Hydroxide (NaOH) Oxidant liquid used in developing. Sulfur Hexafluoride (SF6) Inert gas used in etching. Sulfuric Acid (H2SO4) Corrosive liquid used in etching. Tellurium (Te) Solid metal used in doping, often in gaseous form as Tellurium Hexafluoride. Tellurium Hexafluoride (TeF6) Toxic gas used in doping. Tetraethylorthosilicate [(C2H5)4SiO4] Combustible liquid used in vapor deposition. Tetrachloromethane – See Carbon Tetrachloride. Tetramethylammonium Hydroxide [(CH3)4NOH] Strongly basic liquid used in developing. Titanium (Ti) Combustible metal used as a target in ion implanting. Toluene (C6H5CH3) (Also called methyl benzene) Flammable liquid used as a photoresist. Trichlorobenzene (C6H3Cl3) Combustible liquid used as a photoresist. Trichloroethylene (CHClCCl2) Combustible liquid used for cleaning wafers. Trimethyl Gallium [(CH3)3Ga) Toxic, pyrophoric liquid used to carry Gallium for doping processes. Trimethyl Indium [(CH3)3In) Toxic, pyrophoric liquid used to carry Indium for doping processes. Tungsten Hexaflouride (WF6) Corrosive gas used in vapor deposition. Xenon (Xe) Inert gas used in etching. Xylene [C6H4(CH3)2] (Also called dimethylbenzene) Flammable liquid used as a photoresist.